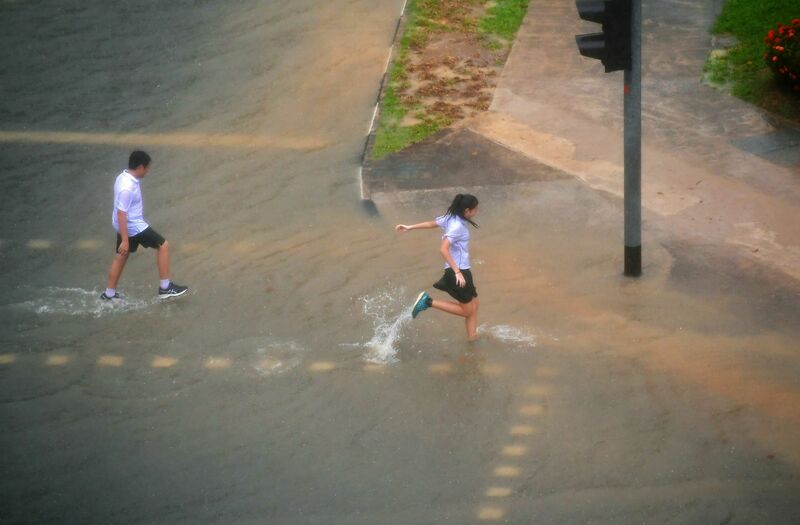 SINGAPORE - Heavy rain fell across Singapore early on Monday morning (Jan 8), causing flash floods in at least nine areas in the eastern part of the island which stranded cars and stopped traffic. National water agency PUB attributed the floods to intense rainfall from the prevailing north-east monsoon. The rain was exacerbated by a Sumatra squall - lines of thunderstorms characterised by a sudden onset of strong gusty surface winds and heavy rain lasting one to two hours - that developed over the Strait of Malacca and moved eastwards, affecting Singapore. Within just four hours, 118.8mm of rain was recorded at the Kim Chuan Road rain gauge. That amount is about half of Singapore's average monthly rainfall in January. Here is all you need to know about what to do during flash floods and what the authorities are doing about it. Exercise caution as flash floods may suddenly and quickly occur during heavy rain. Stay calm and move to higher ground. Do not walk into flooded areas. If you see a flooded area ahead, turn back and move immediately to higher ground as flood waters may rise suddenly. Stay there until the flood subsides. Flash floods: How much rain fell where, when and why? askST: How do you figure out whether to drive through a flash flood or not? Motorists are advised not to drive into flooded areas. 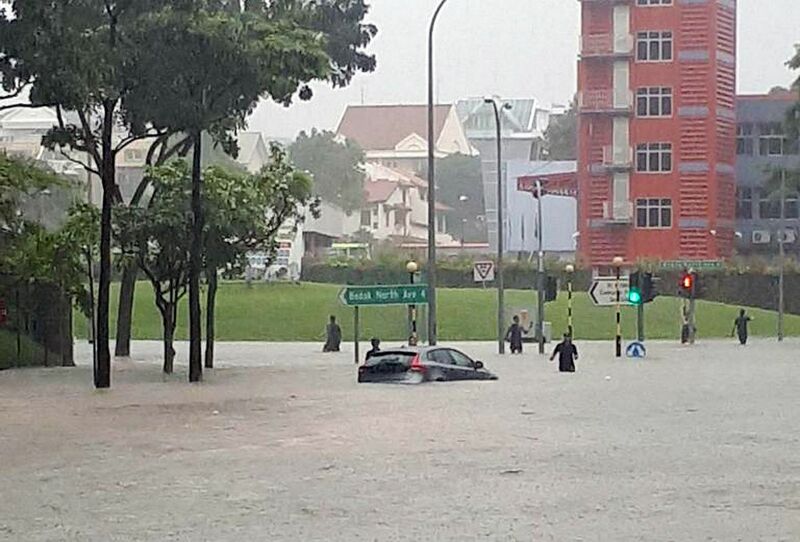 Just 30cm of water may stall your car. If flood waters rise around your car and causes it to stall, leave your car and move to higher ground if you can do so safely. When leaving your car, use a stick to check for steps or open drains in front of you. Moving water with a depth of 15cm can make you fall. Residents and business owners are advised to protect their belongings by placing a stop log, stop board and/or sandbags at entrances to prevent floodwaters from entering the premises. Flood barriers should be activated for commercial buildings. Those whose premises are in low-lying areas should store their belongings at high levels. If you are leaving the premises, turn off utilities at the main switches or valves. Report floods at PUB's 24-hour call centre on 1800-CALL-PUB (1800-2255-782). 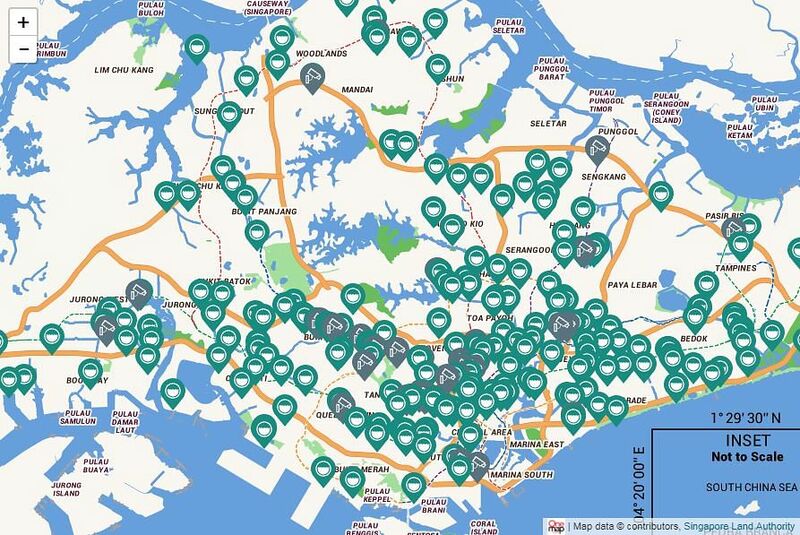 For emergencies, call the Singapore Civil Defence Force at 995. To report pollution or clogs in drains, call the National Environment Agency (NEA) on 1800-600-3333 or PUB. Keep up to date on the weather outlook and tide information via radio broadcasts, the National Environment Agency (NEA) website, or its myENV mobile app. For information on tides, visit NEA's site or call its hotline on 6542-7788. To check the water levels in canals and drains, download PUB's MyWaters mobile app or subscribe to SMS alerts at PUB's website. For closed-circuit television images of road conditions, check the MyWaters app or PUB's website. For updates on flash floods, check PUB's Facebook and Twitter pages or its mobile app. What is PUB doing to combat storms? PUB has adopted an approach known as the Source-Pathway-Receptor approach, where measures are introduced to enhance flood protection. These include upgrading drains and canals, installing detention tanks and flood barriers at buildings, and raising entrance levels to underground facilities. There are already ongoing drainage improvement works to improve flood protection in the nine areas that were flooded on Monday: Tampines Road (opposite Jalan Teliti), Tampines Avenue 12 (opposite Tampines Eco Green), Arumugam Road, Sims Avenue/Eunos Road 8, Sims Avenue/Tanjong Katong Road, Jalan Nipah, Bedok Road/New Upper Changi Road, Upper Changi Road/Bedok North Avenue 4, and Bedok Road/Upper Changi Road East. PUB is carrying out further investigations in Tampines Avenue 12.